Luna2 Seminyak, an internationally-acclaimed hotel, sets a new standard of luxury in a most prestigious area of Seminyak’s beachfront, Bali, through a visionary pop retro design. Spanning across 700sqm area, the 1st spacecraft-themed hotel in Bali offers a luxury and visionary pop design-the 14 super spacious studios, the restaurant, the multi-colored pool, and the Bali’s first private 16-seat plush cinema, Lunaplex. Every corner resembles a futuristic aircraft and each room will have an ambience of retrofuturism, or depictions of the future produced in earlier era. All studio rooms featured with not only one, but three TVs including Brionvega retro-styled tv, along with iPad, Retro SMEG fridge and Nespresso Machine. During your stay, hotel staff will get in on the action, dressing in flight attendant costumes and serves as you enjoy your first-class flight. Afterwards, you can invite all your relatives to enjoy the night in an avant-garde designed Pop! Lounge bar which is opened for private hire only. “Not only the Pop! Lounge bar, you can also book the entire hotel, including our 14 studios, for exclusive use. Bali has never had a property like this before and we aim to impress fashion forward and bold-spirited travelers to feel the unique ambience right after they step inside Luna2 for the first time. 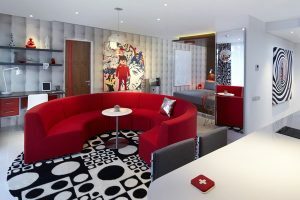 Guests will be immediately transferred to the London’s pop-art era back in the 1960s, while at the same time having the futuristic experience, as the hotel resembles what the future looks like back in 1960s,” said Nadine Saskia, Communication & Events Manager at Luna2. To offer unique vision of the future, Luna2 is dominated with geometric shapes in white surfaces and vivid-primary color in every touchpoint. Every corner of the property is designed by Melanie Hall, a renowned designer who previously headed creatives ideas for Calvin Klein and Harrods. “You can also pick one of our venue for throwing an event, such as stag party, birthdays, and small wedding,” add Nadine. As a symbol of the future, the beachfront property also tributes to the futurescapes, through the appropriately-named communal facilities, such as Orbit restaurant and Space rooftop bar. With this unique slice of luxury and visionary design, Luna2 acclaimed as #1 Small Hotel in Indonesia, #2 Small Hotel in Asia, and #23 World’s Best Small Hotel by Tripadvisor’s Traveler’s Choice in 2016. For family’s convenience, Luna2 also facilitates guest with kids coordinator to keep the kids entertained, while adults self-pampered in jet-lag recovery massage or watching favorite movies in the latest big screen blockbusters. During their stay on Luna2 all travelers will also enjoy stellar standards and superstar service, including VIP airport transfer alongside a bottle of champagne accompanying your trip to hotel, as well as world-class dishes created by award winning Executive Chef, Alanna Agnew. Through her menu creation, she reimagines classic dishes, then fuels them with innovation, imagination and a touch of fun in each of Luna2’s outlets. It is included into all Luna2 outlets, such as Orbit restaurant, the all-day dining Poolside Detox/ Retox menu, Lunaplex’s movie-inspired menu, signature canapes & oysters in Space rooftop bar, award Wine cellar), as well as special requested menu for private dining experience. With the rising of Asian and local Indonesian customer, Alanna could also tweak his western background dishes with Asian tastes. Cosmic hotel concept completed with such luxury services, has brought Luna2 to more international recognition. Tattler UK Magazine selected Luna2 as for their 2015 Travel Guide, listing their top 101 hotels in the world. In April 2015 Conde Nast Traveler (UK) ran a cover story on ‘Bali’s New Groove’ and included Luna2, listing it as the choice for ‘Best Pole Dancing’. Luna2 was selected to the prestigious DestinAsian LUXE List, the magazine’s annual collection of the best new luxury hotels and resorts in the Asia-Pacific region.